Today I want to share a tutorial for a fun paper doll folding card that is easy to make and a bit different to most cards. It is also very versatile. 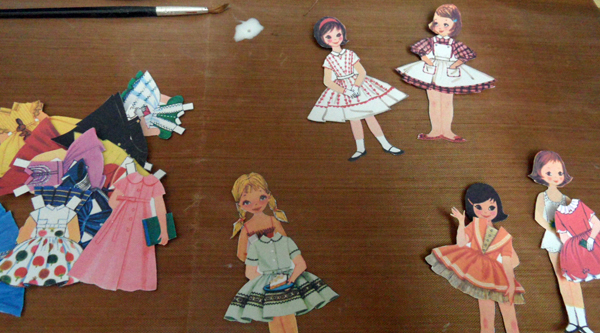 Paper dolls appeal to a very wide age range. 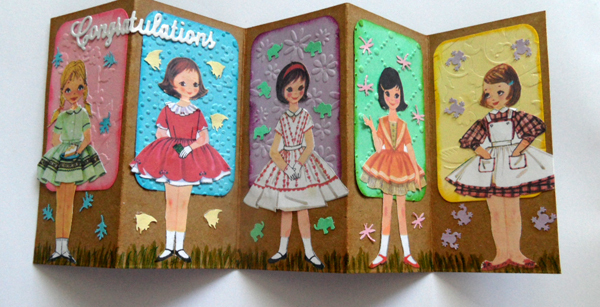 I am really loving playing with the new Tin Teddy Betsy McCall Paper Dolls set 2. I have cut out all the dolls and clothes (and stored them safely in an envelope!) and now I am ready to have fun creating things with them…. and of course, I can always print some more when I use them up! I wanted to make a greetings card that was a bit different from the usual and I rather wanted it to have an overall 1950s theme to match the dolls. First I chose five different dolls and an outfit for each to wear – this stage was a lot of fun and I changed my mind a lot before deciding on who was wearing what. I glued the dresses onto the dolls with Ranger Multi Medium Matte gel. Next I cut an A4 sheet of Kraft card in half lengthways. I took one piece and used my little score board to score lines at 2 inch increments along it. I made sure to crease the lines very firmly. 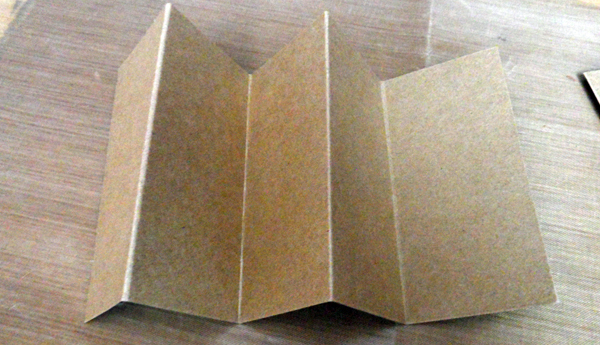 I then folded the card concertina-style and trimmed off the short piece that was left on one end. This is the basis for my card. I used my bone-folder to ensure that all the creases were very sharp. 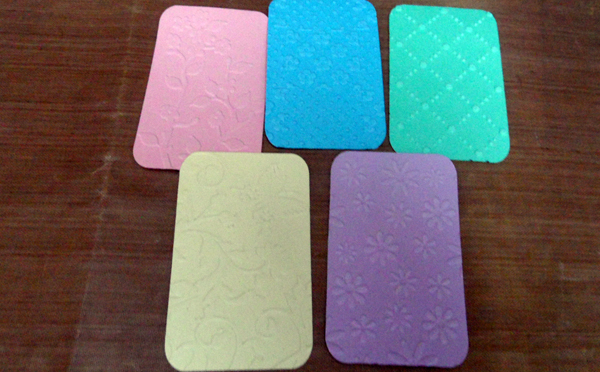 Next I chose five different colours of card. I am using 135gsm card but a wide range of thickness would work fine for this. I picked out these lovely 50s style colours that remind me of ice cream. As well as perfectly matching my theme, these colours are very in vogue right now too! I die cut a rounded corner rectangle from each colour of card with my favourite Nellie Snellen 7 Rectangular dies set (MFD048) dies. You could of course just cut a rectangle with a paper cutter or scissors and round the corners with a corner punch. 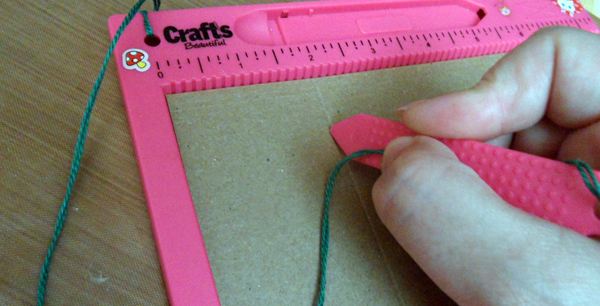 The rectangles measure 2 3/4 inch tall by 1 3/4 inches wide. Then I ran each rectangle through my Sizzix Big Shot with a different embossing folder. This gave an interesting background for the dolls that would not distract from them. I added a little Distress Ink around each rectangle, matching the ink colour to as close to the card colour as I could. If you do not have the right colours of Distress Ink then you could do this stage with crafting chalks or use a watercolour pencil then wet it to soften the edge. I also added some Tea Dye Distress Ink around the edge and folds of the kraft card. This is quite a subtle effect but I think it does make a nice difference. I glued the rectangles on to the kraft card with a tape roller. Now to add the little girls! I tried hard to ensure that each one went on a background that complimented her clothes so she stood out nicely. I fixed them in place with Ranger Multi Medium Matte gel. I die cut the word “Congratulations” using one of the new Die’sire Essentials word dies from Crafter’s Companion. I cut the word from a scrap of Centura Pearl 300gsm card, which has a slight sheen to it that you can not see in the pictures. I used the Matte Medium to glue the word over the first two panels (I scored the bend in it first). Next I used the offcuts from diecutting the panels and stamped some tiny little shapes out of them. The little stamps are from the Teeny Tiny Cassette Punch Set by Friskars. I particularly like the little froggies. I glued the punchies in place with the Matte Medium. Finally I added a simple grass border at the bottom. I drew quick, short strokes with Distress Markers in Shabby Shutters, Peeled Paint and Crushed Olive. I then added another row of grass on top using a bright green Stabilo Point 88 pen. Here is a link to another illustrated tutorial on the Tin Teddy Blog, for another card using one of the Tin Teddy Paper Doll products.